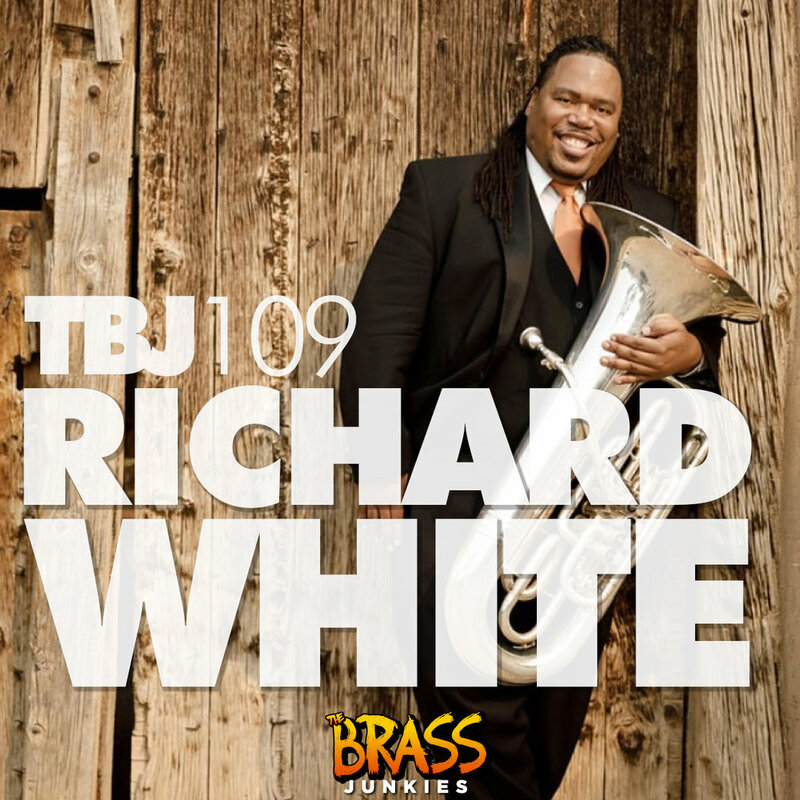 For episode 109 of The Brass Junkies we had a truly inspiring conversation with tuba player Richard White. Richard is the subject of a brand new documentary and his story will leave you on the verge of tears. His journey from homeless four-year-old in Baltimore to the first African-American with a doctorate in tuba is almost too much to believe. He is an incredible musician, teacher and human and we were honored to have him join us. This one will leave a mark! Get the full show notes and links to everywhere you can find this episode of The Brass Junkies here. For episode 102 of The Brass Junkies we were joined by the former leader of the Airmen of Note, Joe Jackson. In addition to being one of the best trombone players in the world, Joe is also a prolific arranger. He talked with us about leaving the University of North Texas in order to tour the world with the Maynard Ferguson Band, playing in the Airmen of Note for 20 years and producing the award-winning Jazz Heritage Series that was heard on 112 radio stations around the world. The dude has done everything! I’ve gotten to play a number of gigs with Joe here in the DC area and he is just a treat to play with. Ears for days! We made it to 100 episodes which is completely insane! An ENORMOUS thank you to everyone who has listened, become a Patreon patron, shared an episode with a friend, posted about it on social media or any of 100 other ways people have supported us in this crazy journey. THANK YOU! I don’t even know where to begin when talking about this interview with my mentor, Sam Pilafian. As you will hear, I met Sam when I was only 12 and he has been an huge influence on me in more ways than I could ever articulate. This episode starts out with some lighthearted banter about a couple of times that I poked the bear as one of his let’s just call it “precocious” young students back in the day! But this conversation gets really serious really quickly right after that. Sam has just come out the other side of a battle for his life with an aggressive form of cancer. His story is hard to even believe. There are tears (and lots of them) in this episode. Some sad ones and some happy ones. There’s also lots of camaraderie between three humans who have been through a whole hell of a lot together, both personally and professionally. I will always cherish this conversation, even though I’ve had thousands with Sam. This one made me awfully thankful to be alive and to be making music for a living. I've had the privilege of playing a number of gigs with Jeff and he is one of the most effortless and musical trumpet players I've ever played with. Just incredible. At one point in this interview I thought he was going to break me I was laughing so hard! Craig is one hell of a tuba player and teacher and a great guy. It was a lot of fun chatting with him about the many things he does in his career. For episode 86 of The Brass Junkies, we did a deep dive on The Falcone Festival. Lance won the first ever Falcone euphonium competition (he is OLD!) and had lots of great stories. I learned a ton from this one. Mark Gould is a legend. They broke the mold with this guy. I consider him a good friend but I hope you won't hold that against me. We have had him on our short list of must-have guests since we started the show and are happy we finally made it happen! Please be warned: This episode contains much more adult content and adult-themed material than any other episode so if that's not your thing, we'll see you for Episode 85! Mark Gould, the former Principal trumpet of The Met, the mastermind behind Pink Baby Monster and author of the hilarious new book, "Orchestra Confidential" joins Andrew & Lance in an episode filled with laughs, stories and swear words. Like, a lot of swear words. WARNING: As mentioned in the above description, this interview is more "adult" than our usual fare. If you are sensitive to this sort of thing, maybe sit this one out. You've been warned. Geoff Pilkington is one of the best horn players in the world and I am lucky to call him a dear friend. I'd been wanting to make this interview happen for a long time and finally we made the schedules work! This one ended up being a little different than the rest. We talked about his entire career but also ended up doing a deep dive into playing the Long Call from Wagner's Siegfried. Hearing about his experience performing it as a part of the Ring Cycle here in DC a couple of years ago was fascinating.